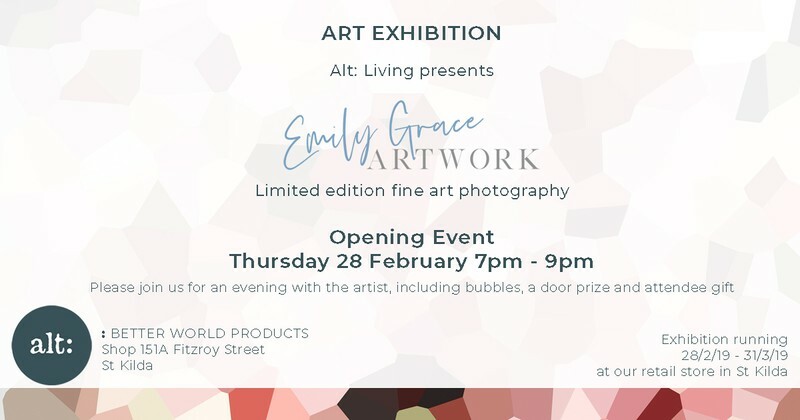 Alt: Living welcomes Emily Grace Artwork to exhibit the extraordinary talents of Michelle Schofield, the artist behind the camera. Michelle's artwork can be admired and treasured, they won’t date, and they will compliment and uplift homes and interiors, and importantly, they are produced using the highest quality materials and production methods. We invite you to join us for our first event of 2019; Art Exhibition opening night. This is a free event, however booking is essential. Please go to our website link to register your attendance.